After more than 15 years of faithful companionship, we bid a very sad farewell to Mazzy the Dog today. She had been very ill for several months, and a stroke on Friday led to our decision to put her down this morning. To the end, Mazzy never lost her fighting spirit and never-give-up personality that always set her apart from other animals we’ve known. I’ve never know a smarter dog or one so much fun to be around. At one point, she knew more than 30 different words and could distinguish between many different toys by name and shape. Everyone says that their pet is special, but there was always something a little extra special about Mazzy. She could anticipate what you were going to do. She was not just tolerant of small children but, rather, adored them, putting up with them pulling her white hair while tossing them a ball to throw back to her. With the exception of thunderstorms, she was fearless. Never a dog to bark or attack others, she automatically assumed everyone in the world was her friend (and wanted to pet her), unless proven otherwise. If you met her once, she would remember you years later. If you were sad, she would sit down beside you and try to cheer you up. If you came home from a long, difficult day at work, she would help you forget it with her favorite game: chasing and catching the frisbee and bringing it back to you. Even after we left her with relatives for a year while we lived in Australia, she forgave us and just wanted to pick up playing where we had left off. 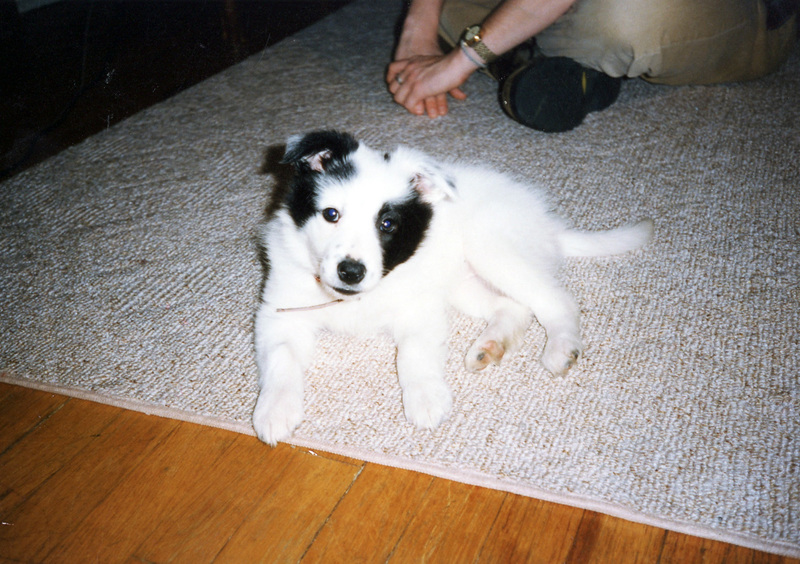 Born as working stock on an actual farm in Mississippi, she was the oddball of her litter, a little white furball, kept in a chicken wire cage. 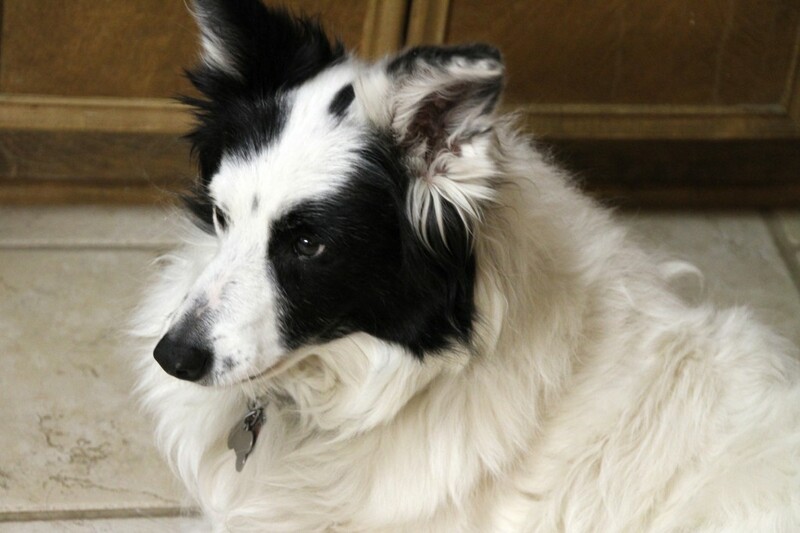 White border collies carry recessive genes that are likely to shorten their lives and cause physical problems, but until the later part of her life, Mazzy just laughed that off. Ever since we took her off the farm and brought her home, she never stopped learning and loving life and wanting to feel alive, right to the end. She never gave up. She was more than just a pet, more than just a friend and a companion. She was as near to human as I have seen in an animal (or expect to see again). Mazzy was something special, and we will miss her terribly, always. Thanks for posting this on such a hard day. 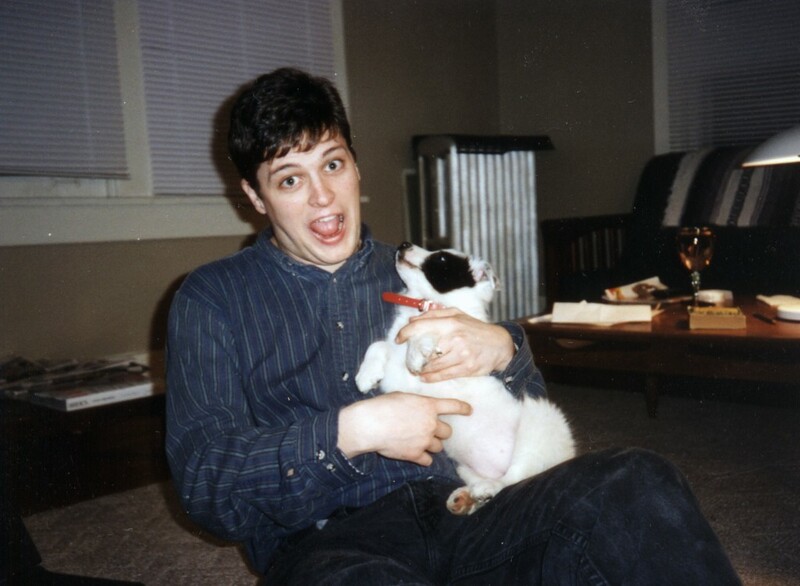 I love seeing the photos of puppy Mazzy. I remember meeting her at your place on McLean and being terrified of that white fluff ball with soooo much energy! I am so glad that through the years I got to know her true spirit (really nothing to fear but my own misunderstandings of dogs wanting to play!) and grow to love her so much! 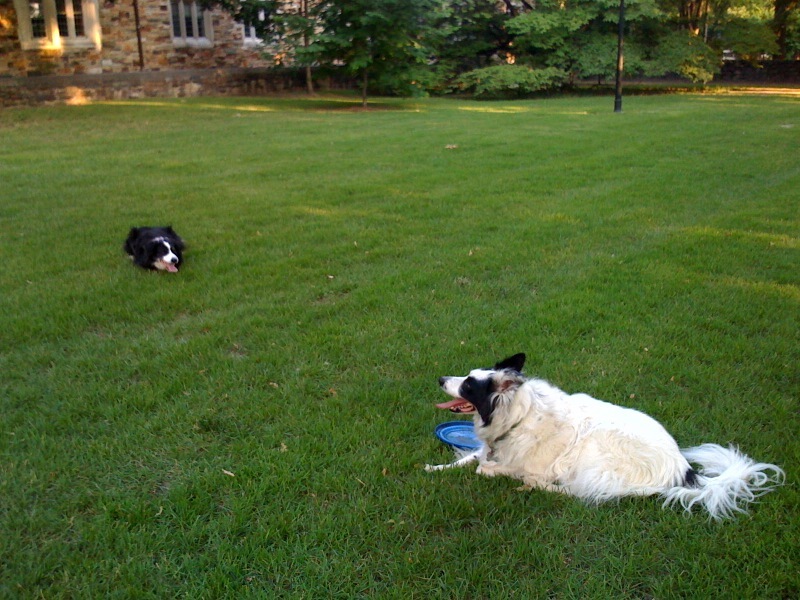 Forever border collies in our family will be called “jake&mazzy dogs”. Miss you Mazzy!!! A beautiful tribute! My heart is heavy twice over. Mazzy was indeed special and will never be forgotten. I remember her as a puppy. She was well loved and had a good life. Mazzy and Jake have the best of human friends. My heart is very heavy and aches for you all. good-bye mazzy… my loving thoughts are with you and your great family that misses you. You’ve captured me since the very first moment I met you not long ago… it is true kath and stacy… she has recognized me every time I stopped by your house, and welcomed me as a friend! My hear is broken this morning reading the news about Mazzy. She was so special and so blessed to have parents like you two. You could not possibly have given her more love or care so please remember that as you grieve for her. She had a wonderful life with you! I believe with all my heart that we will see these precious animals again! So sorry to hear about Mazzy! You were all so lucky to have each other in your lives for these many years! She surely has to be counted as one of the luckiest canines in the history of the West to have the two of you as her housemates and fellow travelers for so long. Your devotion to her during these last few years is a great example of true humanity and devotion at a time when we desperately need both. Thanks, Ken. We were all lucky to have each other. Thanks, Mom Parker. I’m happy we were able to do what we did for and with her. We miss her, but at least she’s not in pain anymore. Thanks, Laura. Mazzy could always recognize good people, and she zoomed in on you right away. Thanks, Mom. We appreciate your support this weekend while we went through the final part of Mazzy’s life, especially while you are grieving Duke, so recently passed. Thanks, Christina. It was good to catch up a bit on yesterday; the visit with your family helped to take our minds off of Mazzy’s final hours. To me losing your beloved dog who has become part of the family I truly one of the most difficult point in one’s life. Your memorial page is really great. I was so sorry to hear about the passing of your beloved Mazzy. Having heard so much about her and seeing the beautiful pictures of her through the years, I know how dear and precious she was to you both. How lucky you all were to have eachother. I hope knowing she is no longer in pain will help the hurt somehow. Please know I am thinking of you. I’m so sorry to hear that Mazzy is now gone. The kindest thing an owner can do is relieve the suffering of our loved pets. I wish dogs had more years to be with us because their lives seem all too short. Our dog Peti is almost 12 now and we can see the effects of his years now. In an all too short time he will be leaving us too and Dottie and I get a tear to the eye knowing the time is getting near. 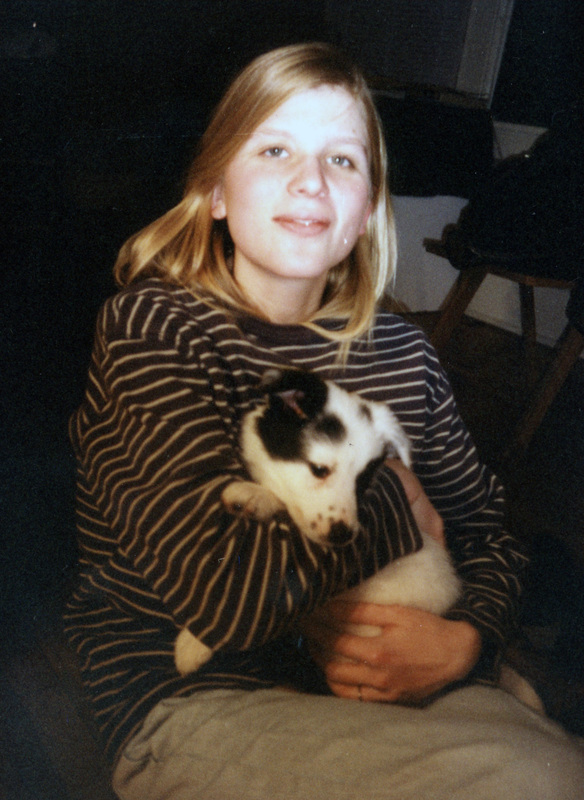 Fifteen years is a long life for a dog and I know you and Katerine wish Mazzy could have been with you fifteen more. Our hearts go out to both of you. Rejoice in the fact that he had a good life and a happy life and that he now is waiting to rejoin you and Katherine in a better place. So very sorry to hear about your loss. My heart goes out to you as you grieve. 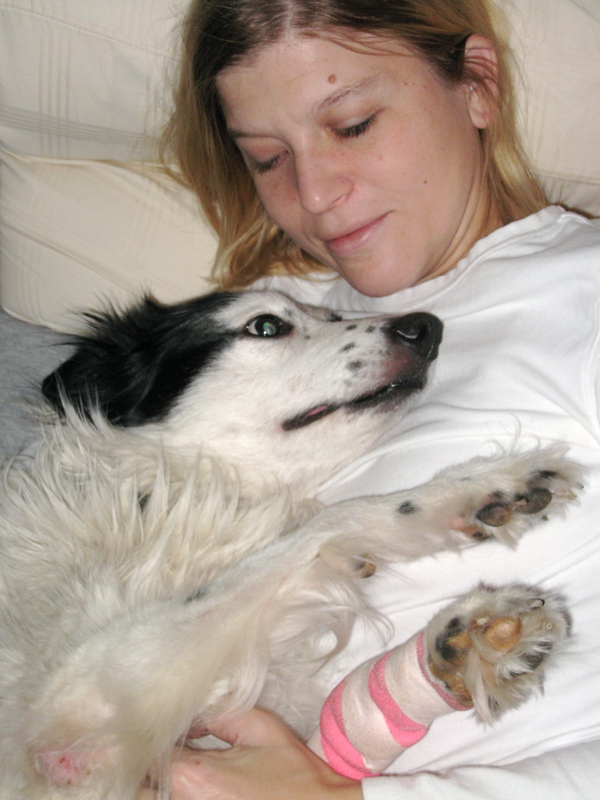 Thank you for the photos – what a wonderful tribute to a very special dog. Sending healing thoughts to you both. I am in the middle of working on a Sunday — so I ended up going to FB and after seeing your photo of Kath in Italy – I was curious where the photo had been taken. I went to truk.com and was instantly hooked. I ended up looking at the last few months of your blog. I was sad to hear that Mazzy had died. I remember her as a puppy and young dog at the Parker’s lake house back in the late 90’s. Can not believe that was 15 years ago. I know that she was an integral part of your family and that you guys cared for her deeply. Even though this happened months ago — just wanted to let you know that I was sorry for your loss. Thanks, Dan! I appreciate your thoughts and memories of Mazzy. We miss her a lot; she was more than a dog to us, probably because she seemed to think of herself a more than a dog. Thanks again for writing in, and I hope you and yours are doing well. I was checking out your photos of Italy and came to your post about Mazzy’s passing. I am so sorry, Stacy! Your tribute to her is wonderful. She could not have had a better life than the one she lived with you and Katherine, and I know she returned that favor in spades. Take care, friend.